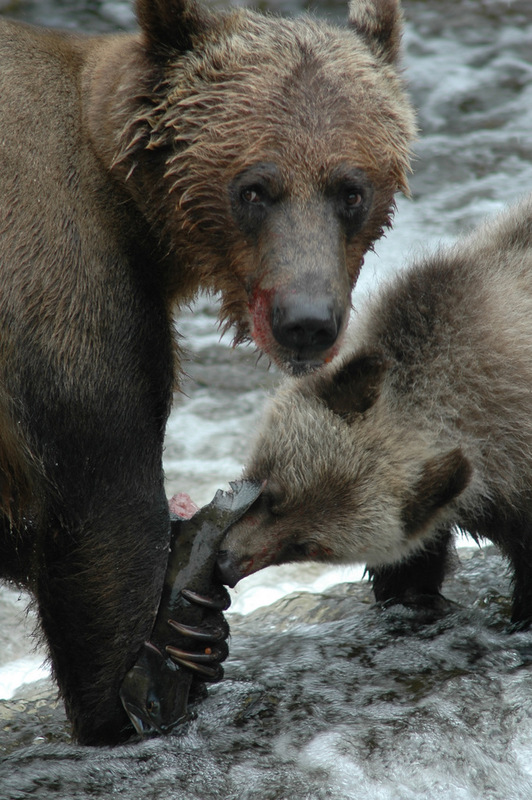 Grizzly bear claws can be used to hold a salmon to share with a cub as shown in the March 29th posting or they can be used to dissect a salmon as shown in toady’s. Janis Worsley from the UK used a long lens to capture this grizzly at work. 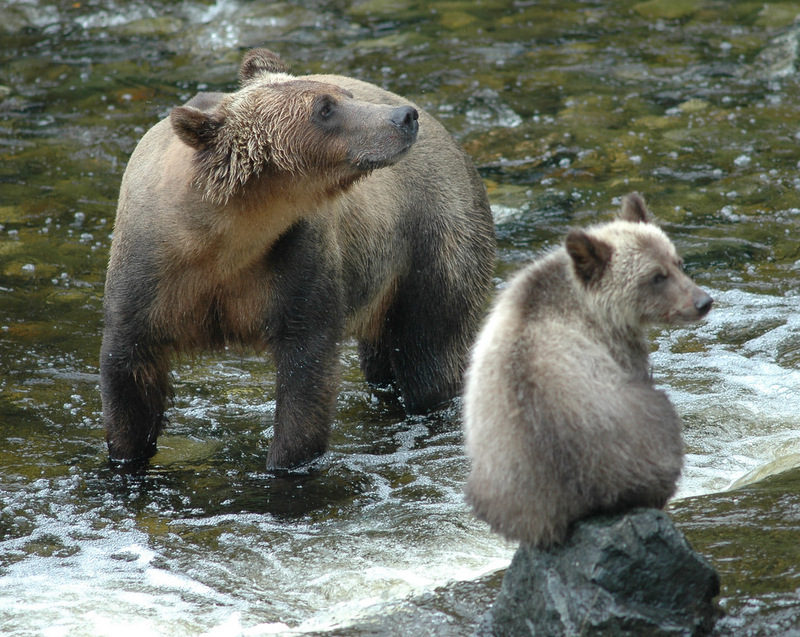 Because of the abundance of salmon in BC’s Glendale River the grizzly bears do not show much aggression towards each other, which encourages females to bring their cubs to the spawning channel to feed. First and second year cubs are common around the viewing platforms and provide amusing photo opportunities. Although the water flowing from Tom Brown Lake is warm, in that it is not glacial cold, this cub seems to prefer sitting on a dry rock while mother fishes. It did come off to eat but was quick to return to its perch. Great Britain’s Lindy Taylor provides another great photo, this one of a mother grizzly bear sharing a salmon with her first year cub. 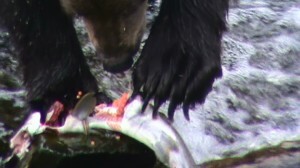 This photo shows the claws holding the salmon so the cub can feed. The normal claw length is seven to ten centimeters (3 to 4 inches) long and useful to catch and hold the salmon. Again the salmon is being eaten headfirst, as the mother and cub need to fatten to survive hibernation….more cub tomorrow. 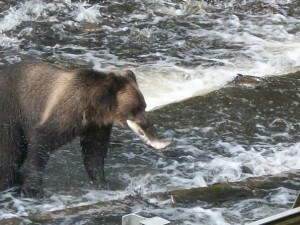 Same bear from yesterday’s post eating the salmon headfirst. This photo was taken on September 1 which is one week into Grizzly Bear Lodge’s use of the viewing platform on Knight Inlet’s Glendale River. 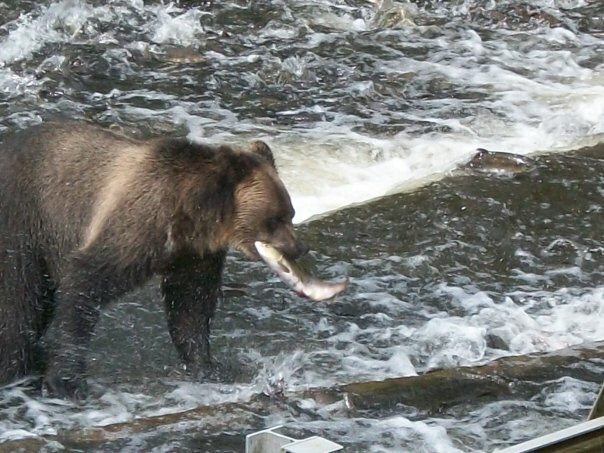 The salmon arrive in the river mouth in mid-August and start up the river in late August giving the bear their first opportunity to catch salmon. 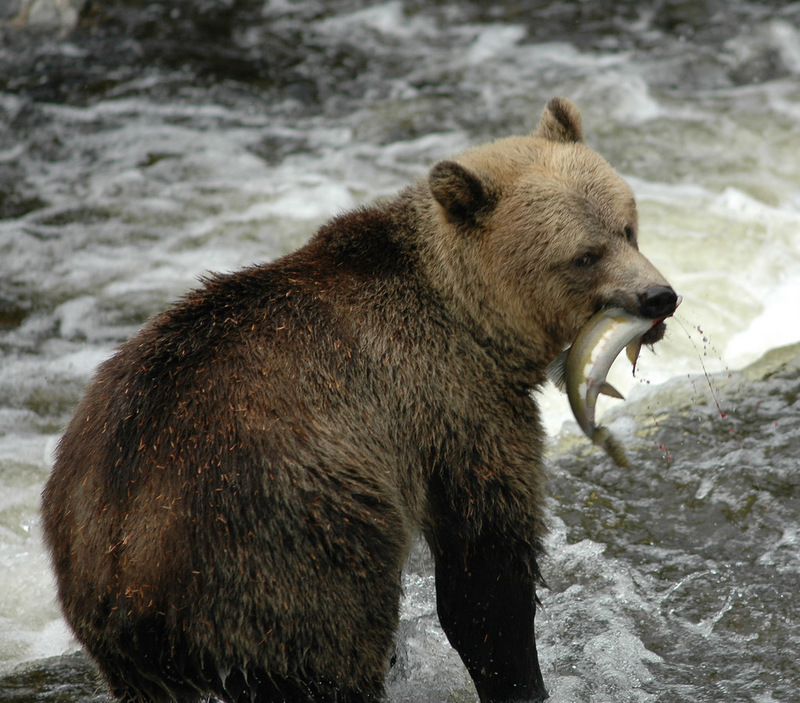 This means that the grizzlies are hungry and will normally eat the whole fish and not be selective and eat only the protein rich roe and belly fat. Lindy Taylor from Great Britain provided this great photo of a grizzly bear that “just” caught a salmon below the viewing stands on Knight Inlet’s Glendale River. If you take time to enlarge this photo you will see that the pink salmon is still bleeding. 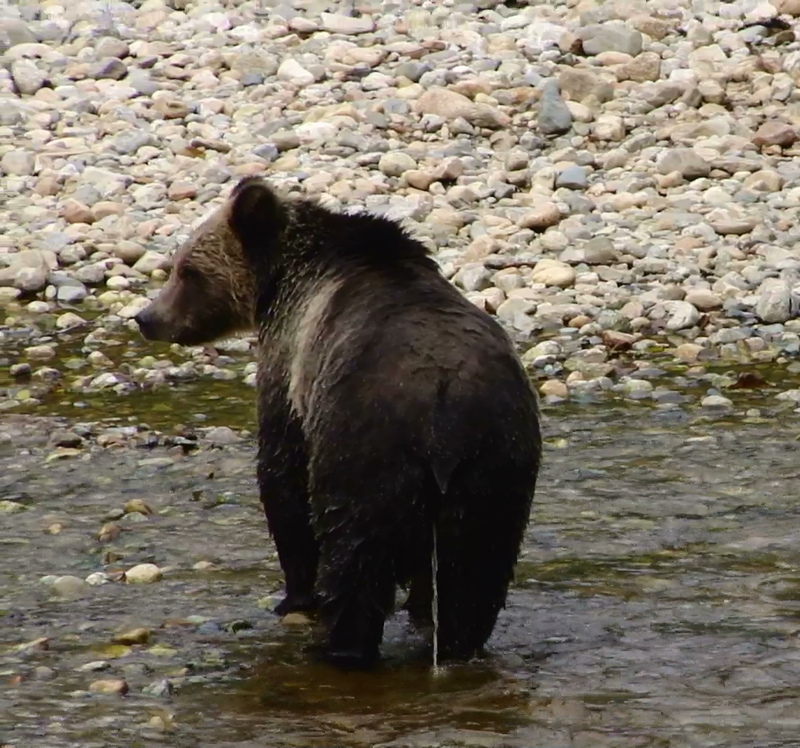 This bear had just come to feed and had not been splashing in the water because it still has litter from a daybed on its back…fishing eating tomorrow. 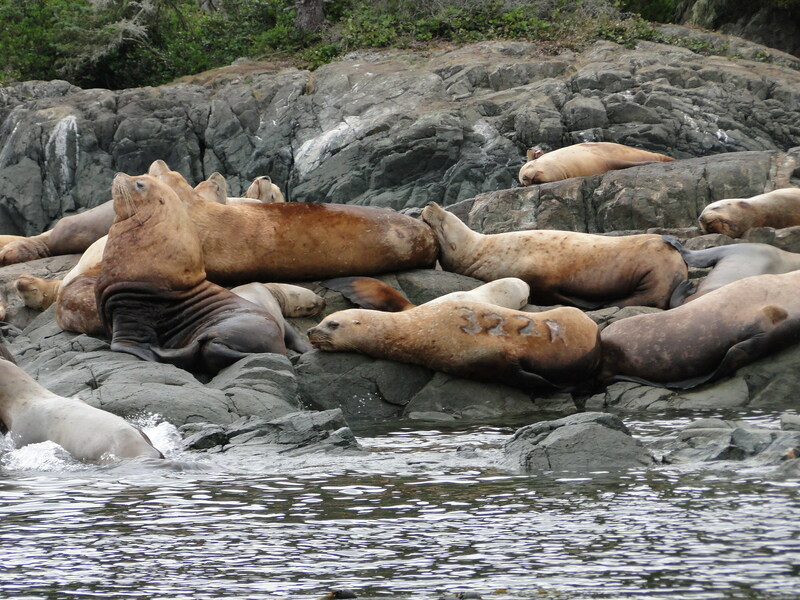 Steller sealions migrate along the coast of British Columbia in the summer, going north in the spring and returning in the fall. Several dozen large males have started to stay with in our viewing area all summer due to the abundance of food. Singapore’s Luwen and Liwen took this photo of a branded Sealion in late September. It was on a small island in Johnstone Strait near Telegraph Cove on Vancouver Island. The western (Pacific Ocean) stock of Steller sealions is listed as endangered. In 2000 researchers begin branding and marking Steller sea lion pups throughout their range as a means to help estimate future population. The number 322R means this Sealion was branded on the Southern coast of Oregon at Rogue Reef in 2003 with 190 other Steller sealions. One of the most often asked question whether a lone grizzly is a male or female? A male is usually bigger than the female and his head appears to be smaller in comparison to his body. Females appear to have shorter legs and are a bit squatter in appearance. Luwen and Liwen from Singapore provide the photo showing the tried and true way to tell the males from the females, which is to watch them urinate. The males urinate forward, and the females backward! If you are lucky enough to see or photograph that, then you will know without a doubt whether the bear you are seeing is a male or female grizzly. These are probably the most photographed pilings in the area of the lodge. 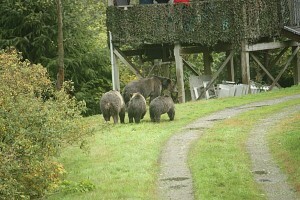 They are located in the Glendale River estuary about an hour and fifteen minutes from Grizzly Bear Lodge on Minstrel Island BC. This is also the location of you tour day with the grizzly bears. The pilings are what remain of an old logging camp and next to the float that is used for the day’s base. The base being where we tie the boat to move to a large skiff used for viewing the bear along the shore in the spring or to transport guests to the shore in the fall to drive to the viewing stands up river. The float is also a comfortable place to have the afternoon picnic. 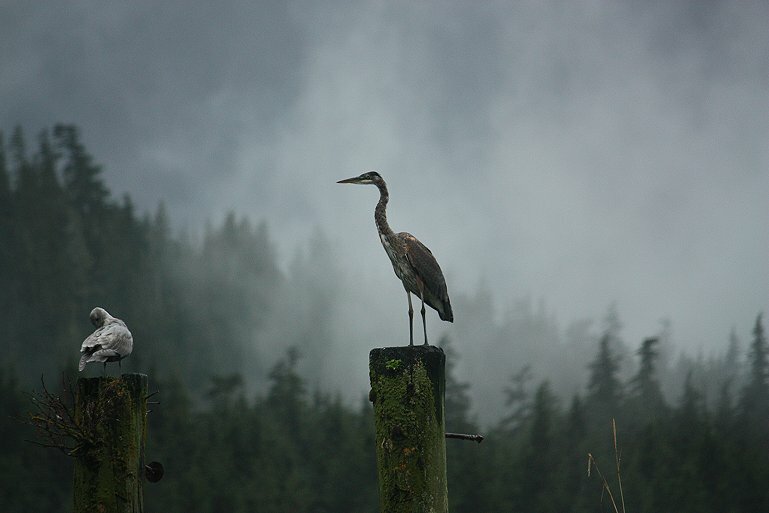 The pilings are used as perches for gulls, eagles and in this case a blue heron. 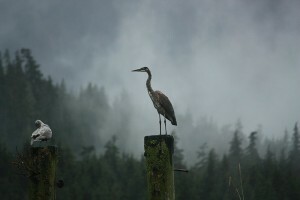 Lynn Morris from Great Britain has captured the heron with an excellent “mystic” background. It is harder to get a good picture of a bald eagle than one would think. 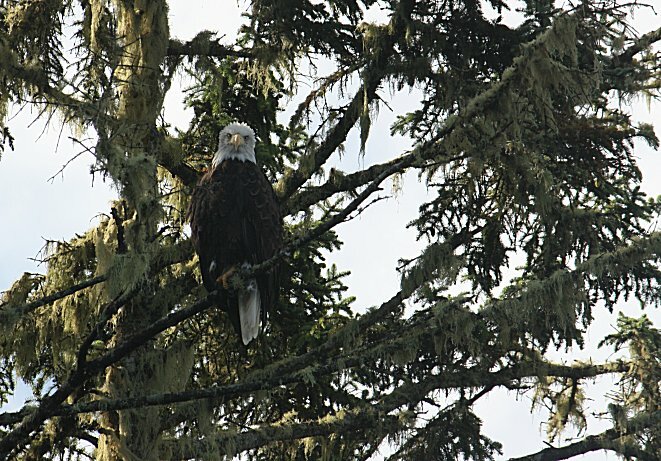 Not because there are few eagles because eagles are found on the grizzly bear tours, the whale safari and the extra day at the wild river. First is that eagle tend to sit near the tops of trees making their back ground either a blue or a cloudy sky. Second is to position the boat far enough away from the eagle so the photo seems on the same level as the eagle but close enough for a good photo. It all comes down to finding a eagle low in a tree close to the water and wildlife in not always cooperative and eagles will often fly further down the shore or higher if approached to closely. The answer in the digital age is many photos and a little luck and you will have one like Lynn Morris’s “Eagle in a Tree”. This photo form one stand toward the other shows an interesting occurrence. The mother grizzly with two two-year old cubs had passed our viewing platform and walked down the road toward the other stand only to come face to face with another bear walking out of the spawning channel area to the natural river on the other side of the road. What happened? Nothing, the bears passed and went on their way. The abundance of food in the area means that there is little aggression between grizzlies as long each respects the other’s comfort zone. A large male may dominate the viewing area for a while but it just means that the other bears wait until it leaves before coming to feed. This could be a two for one photo provided by Janis (from UK). A great shot of a grizzly bear with a salmon and also in the background, if you look closely a salmon coming over the small falls. If you click on the picture it will enlarge to give you a better view. 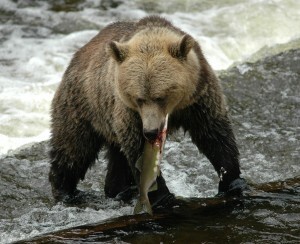 On the wildlife safari trips it is easier to get a picture of a grizzly bear feeding than a salmon over the falls. Had an amazing time here. Started with seeing a black bear at the first evening and ended with a big humpback whale. Saw a lot of grizzly bears, killer whales and a nice nest/group of young bald eagle. Enjoying nature, the spectacular views and the wonderful food.